· Acupuncture has a documented history of 2000 years but it has been in practice for over 4000 years. 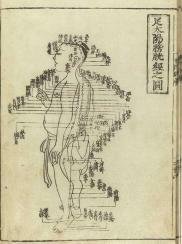 · The first known book on acupuncture is the Yellow Emperor’s Classic of Internal Medicine or Nei Qing Su Wen. It dates to 475-221 BC and possibly older. It is believed to be a compilation of work from many physicians. · Acupuncture consists of using very fine needles to stimulate certain points on the patient’s body called acupoints. These are carefully selected according to each patient’s condition. Only disposable needles are used in the Heritage Acupuncture and Chinese Herbal Centre. · These few needles allow for a better flow of qi or energy in the body, bringing to balance the ying and the yang. · Acupuncture causes very little discomfort or pain. It is regularly paired with infra-red lamps during the treatment session with herbal medicine for use at home, if indicated. · Acupoints are located along channels in which energy flows. This energy is known as Qi. · There are 365 acupoints on the body. · They can be used individually or in combination to create powerful treatment effects. · Channels are a network of invisible pathways along which Qi travels. · If you had a birds eye view of the city, you’d notice the major roadways connecting various neighborhoods. Channels are like those roadways that extend throughout your body. · The channels are often named after the organs which they travel through. For example the heart channel travels through the heart and down the arms. Therefore, the heart may be treated by acupoints on the arm. · affect the circulation and immune system. · Even for conditions of the same name, the causes may be different and each patient will experience the symptoms in different ways.